Stepping into a new country always brings with it a combination of excitement, fear, and unknown. 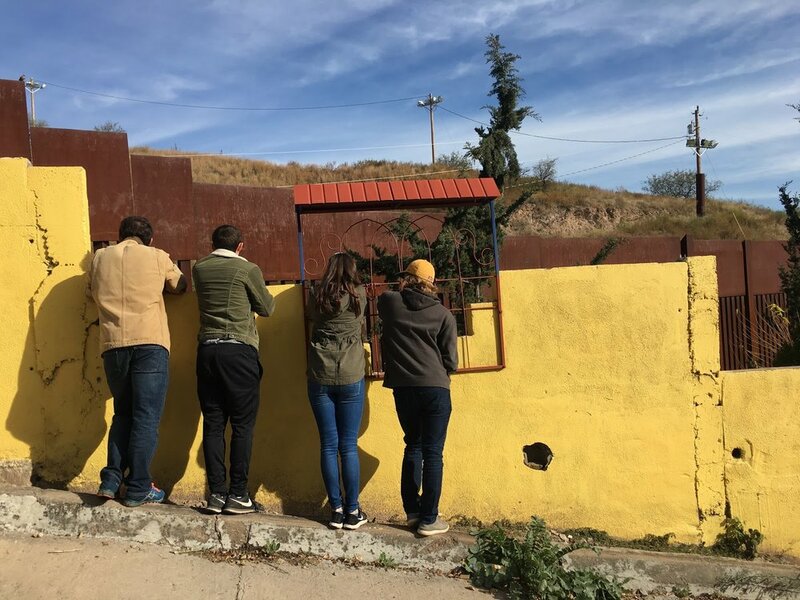 Our Mission Trip to Nogales this past December was no exception. 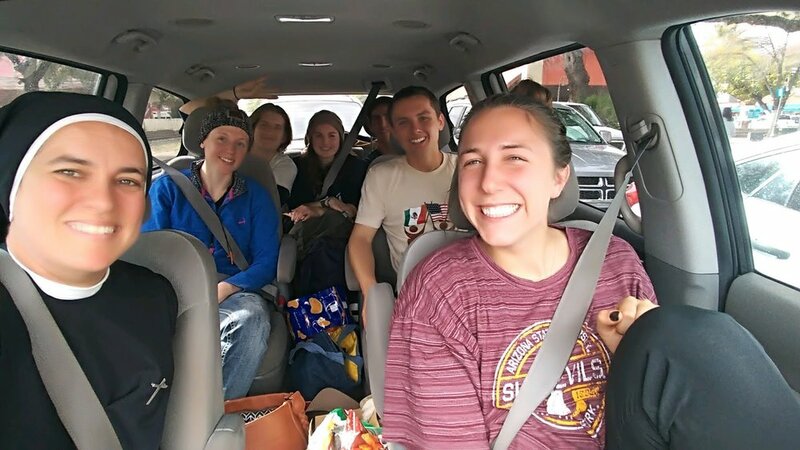 As the semester came to a close, a group of 27 students and campus ministry staff drove down to the border of Mexico and the United States with hopes of sharing life with migrants who were fleeing their perspective homes looking for asylum in the United States. While all of us had expectations for what it would be like, we came away feeling abundantly blessed in our opportunities for service, learning, and fellowship with each other. While we had a handful of students and staff that could speak Spanish, and a handful that had experienced mission trips before, the large majority of our group was both new to the Mexican culture and new to service-focused trips. It was a unique to be able to venture to this new place with a group of students eager to give away their time, talents, and love to the migrants they were soon to meet. Nogales was a unique opportunity for our group coming from Tempe, as it was only two hours south right on the border of the country. Because of this, the mission trip gave us the opportunity to have compassionate hearts for our neighbors, though distant from us in culture and experience, who were physically at such a close proximity to us. As many of you may know, the climate of most border cities is congested and chaotic due to a need for more investment and more reform for both countries’ policies. What was startling to discover in Nogales, was that compared to most towns on the border, this was actually one of safer and easier towns for migrants to find resources and help in. The biggest indicator of this was the organized and prompt system migrants were welcomed into when trying to find asylum in the United States. While many towns require the migrants to sit at the border night after night waiting for a chance to share their case, key citizens within Nogales have produced four crucial shelters that help feed and house many of the migrants during this transitional period. One of these women, Brenda, whose parents founded and continues to run the shelter HEPAC where we stayed throughout the week, has helped work with the government to create a number system to give order to the migrants as they show up the border. For the families that come with many children, this allows them to rest at a shelter, find food, and recuperate without feeling as if they must stay night after night at the border, not knowing when their turn would be for giving plea for this asylum. While we were dismayed at the number of migrants and their poverty-stricken stories, it gave us context to what individuals throughout the rest of the country were enduring who had not the resources this town was striving to produce. Therefore, the focus of our trip was listening to and serving migrants who had come at many costs to the border in hopes of finding refuge from the violence, abuse, and scandal in which they were fleeing. What became apparent is that many of these men and women just needed people to hear their voice, their stories. While the majority of people they encountered barely acknowledged them, we were given the unique opportunity to sit, listen, and comfort in any way we could, even in times when language was a barrier. What we heard was astonishing and eye opening. While we have heard of the mafia, spousal abuse, government coercion, and many other heinous crimes, it was shocking to hear how many individuals experienced it first hand, to see how rampant these crimes are within these countries. Moreover, when we hear about these things on the news or from discussions around a coffee table, it’s much easier to detach ourselves from the emotions and from the people who are inflicted by the pain. By talking with these men and women, by seeing their tears and seeing the pain they were currently experiencing, these problems and these injustices became our own. And this complicates things. How do we go back to our regular lives, back to the comforts of our homes, with the knowledge that people just two hours south of us are enduring so much strife and pain. The reality is we have been called and placed at ASU right now, some as students and some as staff, and there are important missions that we need to be a part of there. However, this experience opened us up to the knowledge that we need to be aware and active in helping our brothers and sisters there on the border. We no longer can be passive, but actually need to seek ways to help and serve them even when we do have this distance between us. A common conviction of our group was our need to return, hopefully sometime in the next few months. While it was hard experiencing this trip and feeling at a loss of what could be the next steps for working towards this important mission, the Lord continued to work within the context of the trip by building community and uniting us in these shared experiences. It was amazing to see how many of the students attending were not a part of our ASUCatholic community prior to the trip, some of them not even considering themselves Catholic. That being said, we were able to come together in our hopes to serve and were able to share laughs, tears, and faith together. From marching in the parade for Our Lady of Guadalupe, to playing soccer on the field with the migrant children, to coming together morning and night in praise and worship, our short stint of time produced an abundance of friendship and memories. Praise God for his ability to unite His children in such a condensed period of time! Claire with some of the migrants, Sister Monica, and a graduate student Mike.